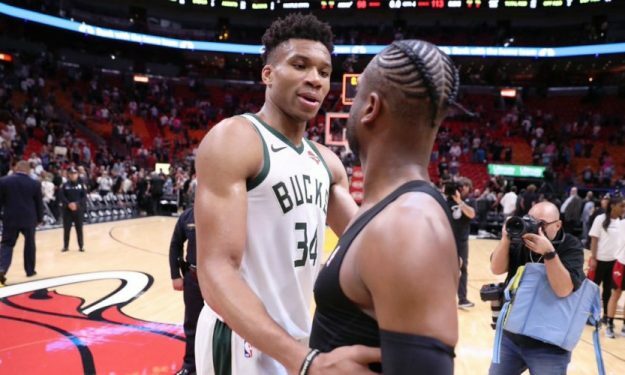 Despite trailing by 20 points (62-42) at halftime, the Milwaukee Bucks ultimately beat the Miami Heat on the road (113-98) and remain the team with the best record the NBA. Here’s the rest of last night’s action and the euro-scorers. Pachulia 4 p 2 r 2 as – Wagner 3 p. 3 r. 2 as. Bonga 3 r.
Marjanovic 12 p. 7 r. 2 as – Bogdanovic 9 p. Bjelica 4 p. 6 r.
Satoransky 4 p. 3 r. 3 as. – Batum 16 p. 5 r. 6 as. Parker 16 p. 2 r. 3 as. Dragic 3 p. 3 r. 3 as. – Giannis 33 p. 16 r. 9 as. Ilyasova 15 p. 5 r. Mirotic 8 p. 6 r.
Capela 14 p. 11 r. – Bender 4 p. 6 r. 2 as. Kanter 17 p. 8 r. Nurkic 11 p. 12 r. 5 as. Belinelli 12 p 2 r. 3 as. Poeltl 12 p. 9 r. 2 as. Bertans 9 p. 6 r.
Gallinari 27 p. 7 r. 2 as. Zubac 9 p. 7 r. – Markkanen 10 p. 8 r. Luwawu-Cabarrot 3 p.